In this part of the world it has been very hot this summer. So taking my make up look from day to night without hosing down first can be a challenge. I am always improvising and trying shortcuts (so you don’t have to!) that can refresh and freshen my look easily and effectively. And I love Off Label uses of proudcts that perhaps no one else has thought of. Before I share my secrets, I will share one more. I reviewed a scrub I am loving lately here. FYI- nothing will look good sitting on top of dry dead skin. It looks crepey and papery and never smooth or glowing. So before you try what I recommend and complain you still look blah, please remember to do your weekly exfoliation. Now, we are ready. Rather than applying more concealer and powder on top of a face that’s been melting all day, I try to keep it fresh. First, I apply a gentle mist of rosewater all over my face. After it soaks in, I dab several drops of my Vichy LiftActiv Serum 10 where there may be dullness and where make up may have melted or settled. Usually under and around the eye area, the neck, and around the mouth and nasal labial folds. Let the serum sink in – you will notice a lovely glow feel your skin hydrate right before your eyes. You are already looking refreshed. I hate adding make up to more make up, as I wear so little to begin with. It doesn’t take much for me to feel, well, spackled. So I was digging around my make up drawer, looking for something to mattify, even tone slightly, and add a bit of radiance. Seems like a tall order. 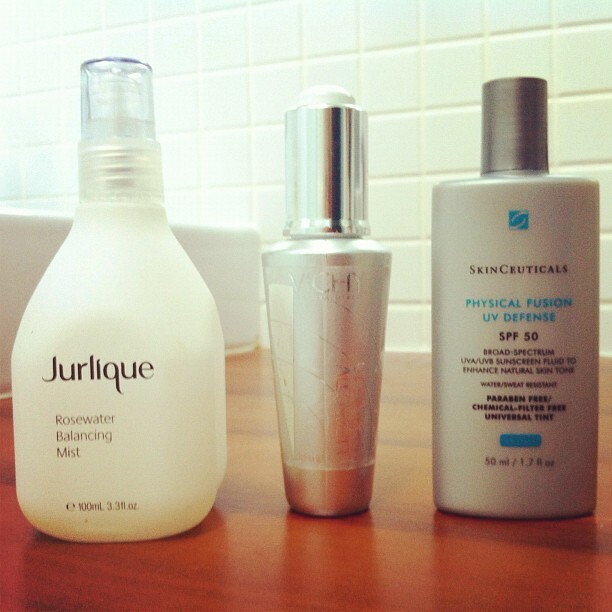 Even though it was 7pm and I was heading out for dinner, my bottle of Skinceuticals Physical Fusion SPF15 caught my eye. I like to experiment and thought “what the heck”. If you read this review of the Physical Fusion you know that it has a tone to it. Super sheer, but still a tone. Nowhere near a foundation, and not even as thick as a tinted moisturizer. But I know it matttefies and that the texture is light as a feather so I grabbed it. I dabbed it under my eyes, on my eyelids, on the inner corners of my eyes, on the tops of my cheeks, and around my nasal area. Right away I noticed an immediate brightening effect, sort of a more wide awake effect. It also has a mattefying effect, and acts somewhat like a primer in that whatever make up you apply on top sticks to it. So I added a light dusting of translucent powder, a little bronzer, lipstain, gloss and mascara and TA-DA! I looked refreshed and polished without looking like I had layers of make up on. It actually didn’t even look like I tried. And, it lasted all through dinner and drinks on a patio, on a hot summer night.